wiiw economists have been recognised as among the most accurate forecasters of economic developments in CESEE. 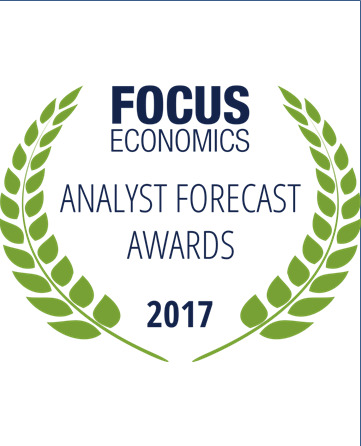 The yearly FocusEconomics Analyst Forecast Awards go to the economic experts from leading banks, economic research institutes and consultancies whose forecasts have been the most accurate over the past year. This year, nine wiiw Economists won a total of 15 awards. Among them were Rumen Dobrinsky, wiiw Senior Research Associate and country expert on Belarus and Bulgaria, and Sebastian Leitner, wiiw country expert on the Baltic States. 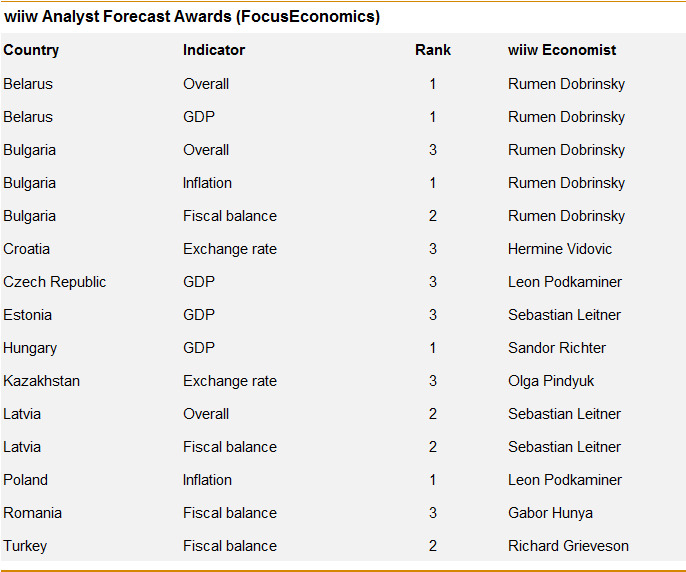 FocusEconomics collects forecasts for a broad range of economic indicators on more than 80 countries around the world. On a monthly basis, the quantitative projections of 900 economic experts are obtained. The ranking places wiiw Economists among the leading forecasters for Central and Eastern Europe. Only UniCredit, JPMorgan, HSBC and Citigroup Global Markets received more awards than wiiw.